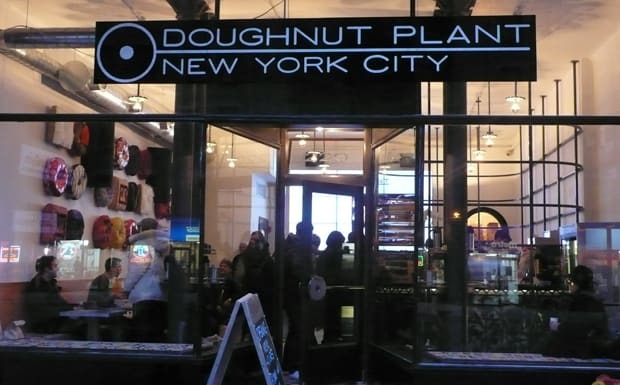 Don&apos;t sweat the national competition, Doughnut Plant you&apos;ll always be first in New York&apos;s heart, especially with a second location in the Chelsea Hotel and new doughnut varieties. Really, what would Dunkin&apos; offer to combat your brand-new salted peanut doughnut? A bear claw? Doughnut Plant, the lovely creation of Mark Israel, puts doughnuts through gourmet food bootcamp. On the menu, they list cake doughnuts and yeast doughnuts. If DD wanted to demarcate their menu, it&apos;d probably read something like fat and fatter. Doughnut Plant offers a regularly rotating selection of seasonal treats. Right now, roll through and pick up a chocolate chip doughnut, made with pecan dough, dipped in chocolate, and coated with crunchy chocolate chip cookies. Okay, so that&apos;ll fatten you up too, but at least you can feel very swank about the whole thing.